Pattaya School No. 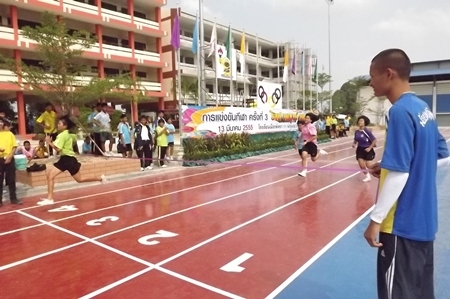 11 held a sports day on March 13 under the watchful eye of deputy mayor Wattana Janthaworanan, who also doubles up as president of a local youth swimming club. 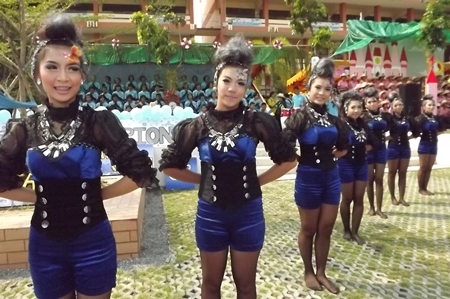 The competition was held between four teams dressed in blue, green, pink and purple colors and individual events were subdivided depending on whether it was junior or senior students taking part. Deputy mayor Wattana Janthaworanan presents medals and certificates to young athletes at the Pattaya School No. 11 Sports Day. In the blue ribbon 100m race, 15 year old Surasak Songsei sprinted to victory ahead of runner up Nathachai Panphrom and third placed Jensak Makpim. 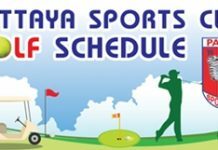 Other notable performances saw 12 year old Thonasak Pala from the Green team take victory in the swimming pool while Singh Wangweng of the Blues finished close behind in second. All the winners and runners up of the events held during the day received medals and certificates to mark their achievements. A race for the line in the girls sprint event. The Blue team cheerleading squad prepare to perform their routine.